You Are Here:Leadership Coaching Resources Articles Bureaucracy is an Archeological Relic: Why do we persist with it? Ever really thought about it? Bureaucracy. Have you really stopped to think what it might be doing to our current way of working and to our economy? Have you ever wondered if there was a better way? Or maybe you’ve just resolved to yourself that what is, is. Maybe you’ve never thought about it at all and simply accepted the status quo. 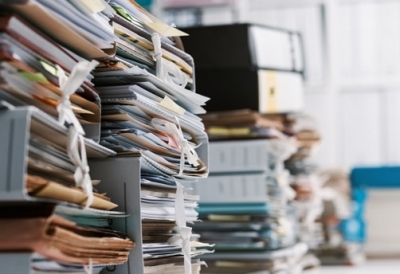 Where did the term bureaucracy originally come from anyway? Apparently, the original French meaning of the word “bureau” applied to the woollen material (often green in colour) that was used to cover desks. Bureaucracy therefore derived from this source to mean office power or office rule; the rule of officialdom. Where did this system called bureaucracy come from? All the researchers and writers point to the person of Max Weber, a German sociologist and political economist, as the founder of bureaucratic management. And when did he live? He was born in 1864 and died in 1920. So, understand the context here. Weber was born in Germany and grew up during the time that industrialisation was transforming government, business and society. He was not in favour of the fact that in his homeland, capitalist practices were in the hands of a small, but powerful group of people based on social standing, connections as well as social and family relationships. A kind of “boys club” based largely on social status. Weber could see however, that it was different in the USA where businesses were run more by those who were the most qualified and most competent. In short, “bureaucracy” was implemented in Europe to change the societal way of running businesses and organisations. Weber argued that bureaucracy was the most efficient and rational way to organise human activity. It made sense for Germany and for parts of Europe back in the 1700 and 1800s, but is it still relevant? Charlie Munger, the Vice Chair of the American multinational conglomerate company Berkshire Hathaway says, bureaucracy’s tentacles should be treated like “the cancers they so much resemble”. Walmart CEO Doug McMillon has called it a “villain”. Moreover, Jamie Dimon, the CEO of JPMorgan Chase states that bureaucracy is a like a “disease”. Peter Drucker, the father of modern management has stated that “bureaucracies are about rules, not results”. Now, it is true to say that bureaucracies have many positive aspects in that they offer rules, policies, guidelines, written documentation, standardised procedures and a hierarchy of authority that provide uniformity in goods or services, and when used appropriately, they can eliminate favouritism and the misuse of power. However, if we are operating in a fast changing VUCA world, or when ego-centric or small-minded people adhere strictly to a bureaucratic code, without thinking about the broader implications or even considering customers, it can override the mission and goals of the company causing inefficiencies, poor productivity, and can ultimately, kill an organisation. In a strange twist of irony though, Max Weber is also reported to have said that “As bureaucracy develops more perfectly, the more it is ‘dehumanised‘ ” where individual freedoms are restricted and where individuals can be trapped in an “iron cage” of rule-based, rational control. Given that we have been at this bureaucracy thing for a couple of centuries, it ought to be really perfected by now. But we all know that it is not. How is bureaucracy serving us? 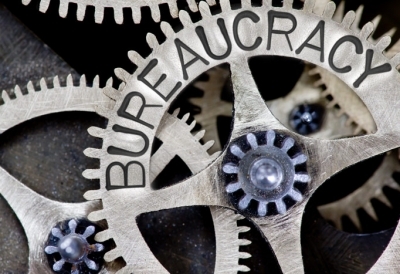 The Harvard Business Review (Nov-Dec, 2018) reports that bureaucracy in the USA for example, is now slowing productivity where large corporations now dominate the US landscape and economy. More than a third of the US labour force now works in companies with more than 5,000 employees where those on the front lines, on average, are buried under eight levels of management. It is speculated that the picture would be similar in other Western style economies as well as in parts of Asia, Africa and South America. Now, if you don’t think that’s bad enough, then do the maths on what bureaucracy costs. Gary Hamel and Michele Zanini (both American management consultants), have calculated that if the bureaucratic burden in OECD economies was reduced by half, then $9 trillion would be added to the economic output. As Hamel points out in his 2007 book “The Future of Management”, bureaucracy is a huge, role-playing game. He argues that if you’re an advanced player, then you know how to play the game by deflecting blame, defending your turf, managing up well, hoarding resources, trading favours, negotiating targets and avoiding scrutiny. Those who excel at the game he reasons, are not surprisingly, very keen about changing it at all. Why do we persist with this kind of management system? Because it’s like a well-worn set of shoes. It’s what we know. It’s what we’re comfortable with. It’s familiar to us. And let’s face it, we’re all creatures of habit. We prefer a work environment where we are in control which means that it’s more predictable and certain. Besides, it’s worked in the past, why shouldn’t it continue to work? The thesis being put forward here however, is that what worked for Germany and parts of Europe back in the 1800s, and has continued to work (mostly) in other parts of the world has now had its day. Why? In case you hadn’t noticed, the world has changed. And dramatically so. Furthermore, if the predictions coming at us are anything to go by, then we are headed into some almighty changes as numerous technologies and advancements are about to all pull into the station at once as it were. As we have said elsewhere, the last 30 years of technological change will seem like a water feature, compared to the technology change of Niagara Falls which is coming over the next three decades. Do you really think that bureaucracy (or any management system that we have used in the past) will allow us to cope with the avalanche that is starting to happen with more changes coming? We think not. It is also being postulated here that commercial companies exposed to a competitive environment and in steeped in bureaucracy may indeed be too late to turn the ship around given that dismantling an entrenched bureaucracy and then installing a different system (whatever that looks like) would take in our estimation, a minimum of 5 years and more likely 10 or more years. By then, with the pace of life and the pace of technology advancing, the business would probably have stalled and died. How do you convince leaders in a bureaucracy to give up a big chunk of their authority and power and start acting like mentors? What will it take for these managers and leaders to recognise that they can no longer act as captains, but need to be coaches instead? When will they realise that given the amount of change on the planet that one leader or person cannot in any way be across all the knowledge, information and advancements. Knowledge can become rapidly obsolete if reality changes. Leaders have got to do it differently. In their 2018 book “Detonate“, authors Tuff & Goldbach emphasise the notion that leaders would do well to now adopt a “beginner’s mindset” where there is a deliberate willingness to consider radical ideas without the constraint of what the competitors might be doing or what has worked in the past. In fact, they go so far as to suggest that today’s “best practice”, could be a sure path to disaster for tomorrow. Further, the authors advocate the concept of “minimally viable ideas” which is the notion of constantly tinkering to test and learn. Many experiments they suggest will go nowhere, but a few will open valuable new doors. Hence, they argue that managers need to encourage employees to come up with new ideas especially those that question the status quo. Moreover, recognise that in essence, if we believe Dr Ron Westrum, formerly Professor of Sociology and Interdisciplinary Technology at Eastern Michigan University, there are three main business cultures that explain how organisations process information (see the table below). Largely speaking, while some organisations that we are aware of might be pathological in nature, most are bureaucratic in style. What we’re proposing here instead, is that businesses need to be more generative in form. Some years back, there used to be a popular saying that went “small is beautiful“. It’s still true today. In fact, that’s a key to future success. The Armed Forces for example, might be large in nature, and in ages past, the army would all band together as a whole and charge over the hill towards the enemy. Not any longer. Instead, the work is done in small well-trained units who are specialists and experts in their field where they are adaptable and flexible and able to move at a moment’s notice. Further, following the “small is beautiful” theme, leaders need to be courageous and generative by risking small steps and trying new approaches where the intent is a culture where it is safe to fail. This is a critical point. In this respect, research about the breaking down of a bureaucracy comes from Google who set about trying to increase productivity by creating the perfect team. After four years of research, they embarked on “Project Aristotle” to try to discover why some teams stumbled and others soared. They looked at half a century of academic studies examining how teams worked and analysed 180 of their own teams, but no factors were significant until the researchers came across some work from Carnegie Mellon. In brief, the factors that bought about team success related to what was termed “psychological safety“. This included everyone in the team having a turn to talk (i.e., no one or two individuals dominated the conversation) and the team had empathy and understanding for each other. Ultimately, it was concluded that being psychologically safe was about being free enough to share things that make members anxious or emotional without fear of recriminations. The best teams in Google are those where members listen to one another and show sensitivity to feelings and needs. Do you really think that this could happen in a large bureaucracy? Only if the large corporation or business was divided into small elite project teams where psychological safety was paramount. In other words, it is being argued here that small cross-functional, self organising and empowered teams that are well trained and that operate within a generative culture is the way to managing a business that confronts a future which already sits in a VUCA world (Volatile, Uncertain, Complex, Ambiguous) and where advances in technology and science are rapidly escalating. Have any organisations been able to break out of the bonds of bureaucracy? Go and research Haier, Morning Star, Nucor Steel, Svenska Handelsbanken, and the Linux Foundation to mention a few. It’s not an impossible task. Who then are the leaders who are going to be courageous to try out a new way working using elite well-trained teams working in a generative culture that is psychologically safe with the goal of (1) delighting customers (2) delighting employees and (3) being adaptable? Such leaders will be the “Top Guns” because they realise the old bureaucratic ways of working are no longer working or “fit for purpose”, and they are brave enough to leave the safe calm harbour, and dare to be different; the rest will sadly fall by the wayside and no doubt take their companies and teams with them.